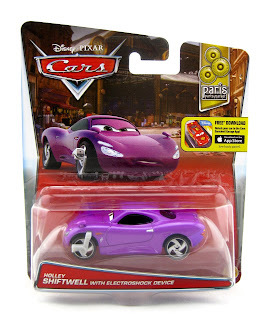 From Cars 2, here we have yet another brand new 1:55 scale diecast release from Mattel...Holley Shiftwell with Electroshock device! She has just hit shelves as part of the 2016 "Paris Parts Market" sub-series (#3/6). As shown in the screenshot above, Holley appears this way about half way through the film when she uses her electroshock device to tase Tomber (who she believes to be one of the bad guys) in the Paris black market. Though this version of the character is only slightly different than past releases (it basically just adds the shock device as well as a new facial expression), I like that this is a screen specific moment that we've never had as a diecast before. I just found this one at Walmart this afternoon, so be sure to check your local stores for availability! Best of luck on the hunt and please feel free to leave your thoughts in the comments below.